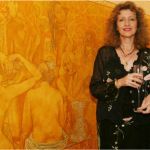 Aleta Michaletos is a well-known and respected figure on the South African Art Scene. She is an extraordinary artist, who creates works of art that exuberate energy and a general feeling of serenity, drawing one into the painting and opening a new intellectual world that stimulates a brand new thinking process. Aleta takes her inspiration from life, people, words and nature. She has mastered the art of putting normally unheard of things together, into a composition that reveals the mystery of the invisible that lies beneath the surface of the canvas. “I can see the pattern of creation” – Aleta is a true Virtuoso, her outstanding abilities enabling her to express herself in any medium of her choice. She is not addicted to perfection, but rather in developing her own style, always reinventing herself and her techniques, creating a shrine to life with each painting.